Today we named the three Osprey chicks that hatched out at Dunrovin ranch. It was a complex process, involving a selfie contest, voting by the site members, and fabulous prizes. I have to confess that I got a bit caught up in the whole contest. As a Dunrovin employee I didn’t submit a name or vote, but I was passionately in favor of some names, and passionately against others. My reasons were fairly idiosyncratic (for instance, one set of names was submitted six different times, and I turned against that one just from seeing it so often) but deeply felt. Last night, before I tallied the votes, I was discussing the matter with a friend over beers. My defense at the time was practical – I would care, because I’d have to type the selected names probably a thousand times before the chicks hopefully fly south as young adults this fall. But I have to admit that there was more to it than that. I was worried that too cartoonish or obvious or awkward a name would hurt the chicks – not by any direct impact on them, but by making the web cam viewers take them less seriously. But, of course, there is no reason to believe that Osprey have dignity to lose, or that a silly name for a beloved bird would somehow make people less concerned about conservation. I just, apparently, care deeply about the issue of bird naming on every level. Fortunately, I can now put my irrational fears aside, because one of my favorite sets of names won. 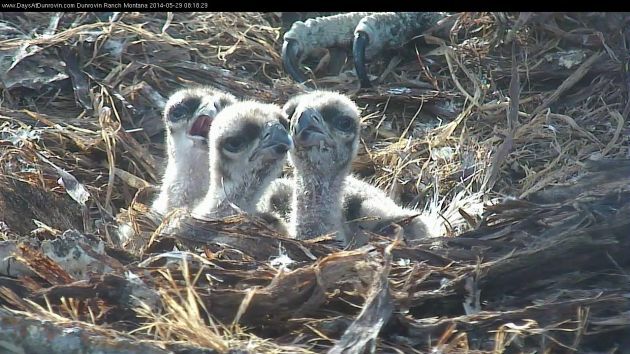 Introducing this year’s Dunrovin osprey chicks – Lunar, Sol, and Shadow, named for the eclipse that took place the night the first egg was laid.